Dixieland Bands have taken to the streets and local bars all over New Orleans are doing a booming business tonight as it was announced that estranged Saints football coach Sean Payton will be returning to New Orleans for the foreseeable future. It is being reported that the deal will be for at least the next 5 years and will net Payton somewhere in the neighborhood of $7,500,000 per year. 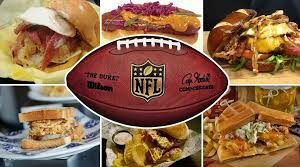 It is also rumored that the deal will include all the gumbo, crawfish and jambalaya that Sean can eat. No word as yet as to a beer tab to go with the other goodies but I am sure that can also be arranged. No one wanted to lose Sean Payton. Saints owner Tom Benson is doing the “Benson Boogie” tonight! His wife Gayle is no doubt dancing right alongside of him. The Bensons have recently acquired the New Orleans Hornets NBA basketball team. Their commitment to the New Orleans community is strong and healthy. They give most generously to local schools and hospitals and are both much beloved in the “Crescent City”. The happiest guy in the “Big Easy” tonight has got to be Drew Brees…..and the most relieved too. Drew has not had the best of seasons with Payton sitting out his season long suspension in Dallas amidst speculation that he might just stay there. Roger Goodell’s attempt to destroy the Saint’s organization has failed. 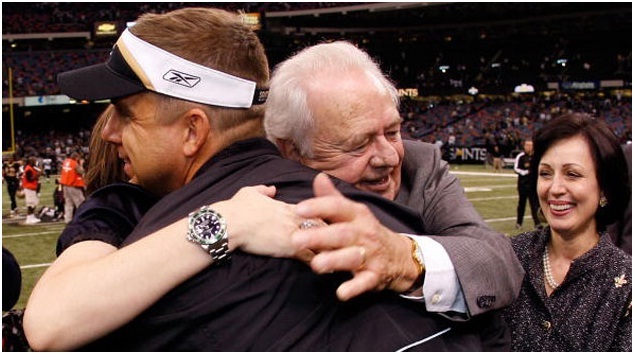 Tom Benson, Sean Payton, Drew Brees are back together, stronger than ever and it is being rumored around the league that Goodell is on the way out….partly for the way he consistently mis handled the bounty gate mess. Payton had a pre existing contract agreement with the Saints which lasted through 2015, but Goodell went so far as to void that contract because of language he deemed inappropriate. The old contract tied Payton’s’ remaining with the Saints to the tenure of Saints General Manager Mickey Loomis who was also suspended by the commissioner’s office. Goodell’s office stated that the league did not want to set that precedent, so it voided the contract. No other contracts were voided in the NFL for 2012 and Goodell’s actions came under fire, once again. Sean Payton’s regular season record with the Saints stands at 62-34. In both 2009 & 2011New Orleans went 13-3 for the season culminating in a Super Bowl Championship in 2009. Welcome back home Sean Payton!